Final Resting Place is almost here. I can’t wait for you to be one of the first ones to read it. Twenty-nine-year-old Abraham Lincoln has spent his entire adult life running from his past—from the poverty of the dirt-floor log cabin where he was raised, from the dominion of his uneducated father, and from a failed early courtship. 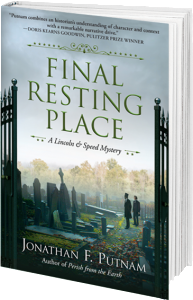 But now, in Final Resting Place, Lincoln’s past is racing back to haunt him.